The fierce gale of May 18,1894: "Lake Michigan was mad ~all night -and for several days before -the sea ran mad -18 vessels wrecked -woman froze to death in the rigging of the Cummings, Milwaukee, Wis. 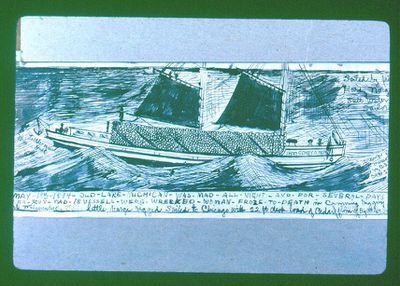 In all the fury, the barge-rigged Sidney O. Neff was sailed by five hardy Norwegian salt water sailors with a 22-foot deck load of cedar from Big Point Aux Sable, Mich. to Chicago, arriving safely. " For the storm -Beers, History of the Great Lakes, Vol. I, p. 767; listings for the Neff, Beers, p. 865; Inland Lloyds Vessel Register, 1893; various Ship Masters' Assoc. Directories, 1903, etc.